"I'm probably the most spiritually satisfied I've ever been," I wrote last year. Apparently, there's a way to be even more spiritually satisfied, because I feel even happier with this section this year! 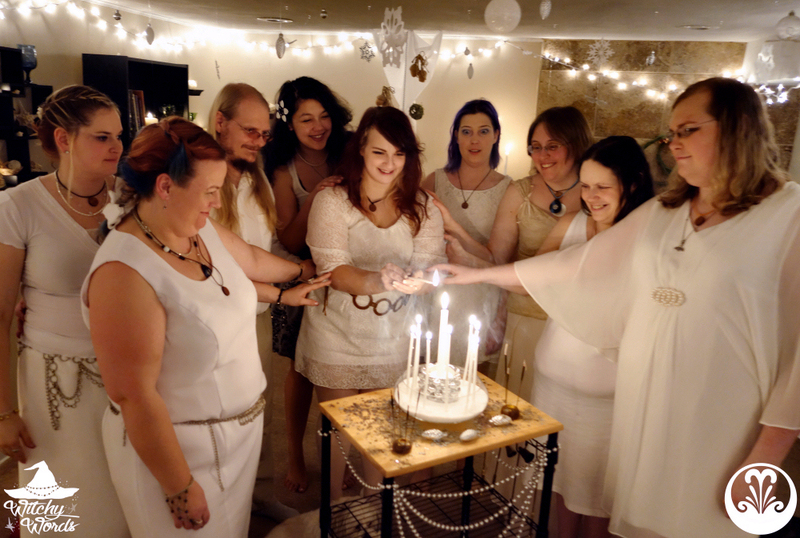 I'm active in the KC pagan community, I volunteer as a photographer for Liithi Lushede, I'm a regular blogger here on Witchy Words, the blog exploded in 2015, and I'm the Circle Coordinator of my amazing chosen family, Circle of Fountains. Our membership numbers grew from just three when we started in Ostara 2014 to now eight Primary Members, three Guest Members, three Associate Members (significant others of Primary Members) and two Novices! Eight Primary Members means we're complete; we're no longer taking candidates for Primary Member positions. We also will only take two Novices at a time, so we're full there as well. We have a little wiggle room for Guest Members but, for the better part, we are happy with where we are. Considering that we're pretty selective as to who we let join, that's pretty darn impressive. In addition, we've been asked to do the main ritual at Kansas City's Pagan Pride Day as well as the opening ritual at Gathering of Pagan Souls in the Ozarks. I'm so incredibly proud of my circle. Here we are leading community rituals and teaching and giving back. This is what a circle should be. So, all-in-all, this is the area of my life that I feel needs the least amount of work aside from my relationship with my husband and our home. It doesn't mean that there's nothing I could do to improve it, though! With how happy I am with this area of my life, I'd almost shade it to completion. But there's always room for improvement, so one opening it is. This is an issue with Witchy Words that I've identified for quite some time. 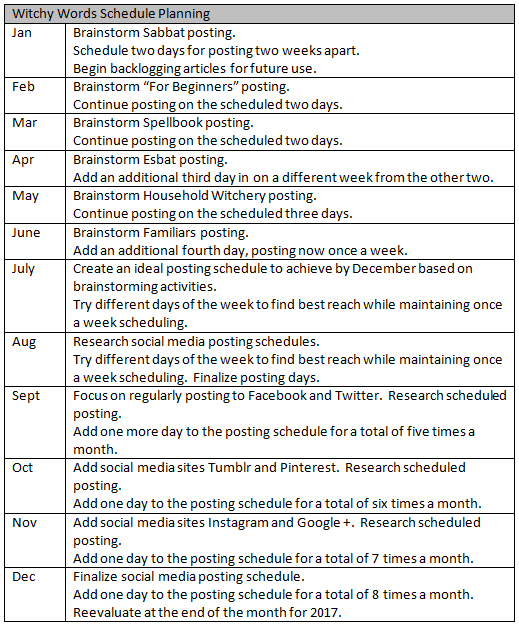 Every year, I try to implement a posting schedule and fail. Last year, I wanted to take a month to brainstorm posting schedules in July, plan them out in August and implement the schedule by October. July is when we were told we were moving. I never got a chance to get that far. And, while the frequency is a concern of mine, so is the content. If I start following a frequent posting schedule, I don't want to stretch for content or produce utter rubbish for you. That's never been the point of this blog. So, with posting more often comes posting quality content about the things you guys come here for the most. Fortunately, thanks to last year's goals, I have some nifty categories up above that can guide me. Of course, if you have anything specific from those sections that you'd like to see, let me know! I always want to know what my readers are interested and what they'e thinking. If I can help, that makes my day! Finally, I need to get on top of reviews. I have ample material from TheWitchery.ca and two more teas from Blackthorn Hoodoo Blends that need reviews. I haven't forgotten by any means; things have just been hectic. The best part about the way we at Circle of Fountains are running our esbats is that they're very open ended. We have two members committed to teaching each esbat. That means, if I'm not committed to teaching, I'm free to do what I need to do while the circle is open. If that means drink tea and take notes or do a spell using something from The Witchery, then that's what that means. It'll give me definitive times each month to get on top of what I'm behind in from last year's crazy moves. Keep in mind that, while this schedule starts off at just two posts a month, those are two scheduled posts. If I have more relative content - say, our circle's Imbolc ritual, Liithi Lushede's Imbolc ritual and my personal Imbolc altar - it will all get posted during the appropriate time frame. I just want to have a confirmed certain schedule to start with. If I post extra around that, then that works too! What are your spiritual goals for 2016? Thank you so much, Dawn! Your kind words mean so much to me. I truly appreciate it! I think you are just doing fine, if I might say. 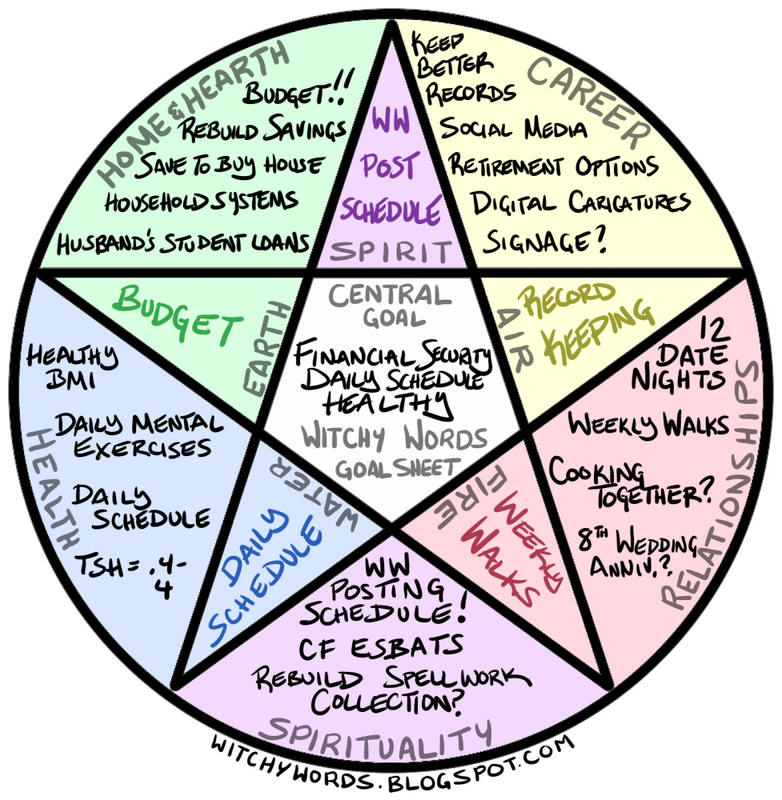 The Witchy side of the blog draw me in in 2013 or 2014 and I never missed any post since than. You have inspired me (https://www.instagram.com/p/BAQA0IytrO9jtPAQAHQO_8Xt5h6dq8qWafd4J40/) and I think your posts are very interesting! I love the posts about your personal life too though, and I felt sorry for you when you had to move, twice. I watched you when you were still in the appartment and the pets were getting sick, I watched you through your sickness and I will watch you for many years to come. Hence, I even used your goalsheets to make my own. Thank you Marietta, never think you are not doing great!